Anyone can send me their WWII type pictures and I will gladly display them in your own Album. View these amazing photos provided by Walter Howard "Walt" Williams, a WWII Army and Air Corp Veteran, born and raised in Scott County, Tennessee. Walter is a brother to Julian Eugene "Gene" Williams, a Navy Veteran of the Korean War. Attack on Pearl Harbor, December 7, 1941. NOTE: These pictures were copied from the Internet and are the property of THE DENVER POST, and are displayed here only as an extension of the original website, for viewers to see and know the horrors of war. Although these pictures were not taken by Walter Howard "Walt" Williams, a WWII Army and Air Corp Veteran, he does remember something about, and has experienced a great deal of, what we see in these pictures. Walter Howard "Walt" Williams was born and raised in Scott County, Tennessee. He is a brother to Julian Eugene "Gene" Williams, a Navy Veteran of the Korean War that you can see in another album on this website. The below collection focuses on The Pacific War, a term referring to parts of World War II that took place in the Pacific Ocean, the islands of the Pacific and the Far East. The start of The Pacific War is generally considered to be the Japanese attack on Pearl Harbor, Hawaii on December 7, 1941. 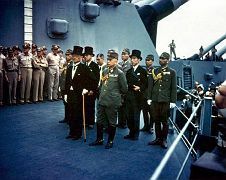 The Pacific War pitted the Allies against the Empire of Japan and culminated with the atomic bombings of Hiroshima and Nagasaki in August of 1945, Victory over Japan Day on August 15, 1945 and the official surrender of Japan aboard the battleship U.S.S. Missouri in Tokyo Bay on September 2, 1945. D-Day in Color, Photographs from the Normandy Invasion: Original color photographs of the D-Day invasion of Normandy during World War II. From British and American soldiers preparing for the invasion in England to German prisoners being marched through the streets after France’s liberation, these images are some of the only color photographs taken during the war. This set of photographs is primarily from the German Galerie Bilderwelt, part of Getty Image’s exclusive Hulton Archive collection. LIFE Magazine "70 YEARS LATER - D-DAY" was provided for copying by Walter H. "Walt" Williams, WWII Veteran. They are trying to collect as many WWII planes as they can find and restore them back to flying again. LEON HARNESS: Enlisted: 03/28/1944, as a PVT, for a Term of 5 years, or if necessary for duration of the War plus 6 months. Enlisted at Oneida, TN on 03/28/1944 and was Honorably Discharged on 08/19/1944. Served for less than 5 months. It seems he was discharged from a (Det of Patients, Sta Hosp) Military hospital which would indicate he either served in a Medical position or he was possibly wounded and was sent to that hospital then discharged. Kenneth Scott McCarty, of the Straight Fork Community, wanted to share these old WWII era photos in hopes that someone will be able to identify some of these men. If anything is known, the information will be posted below the picture.